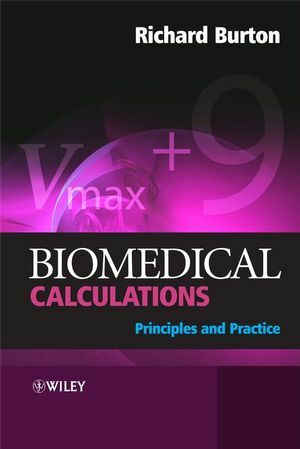 Biomedical Calculations: Principles and Practice is an accessible, student-friendly introduction to calculating, applying formulae and solving quantitative problems within these subjects. This book targets a problem area for many students and aims to give them the confidence which they are so often lacking when undertaking scientific calculations. It takes a unique approach to the subject and uses unit analysis as a central theme throughout the book to enhance student understanding. Clearly structured throughout, little basic knowledge of mathematics is assumed, but even the most numerate readers will be interested in the sometimes-novel biological detail. Numerous worked examples, supplementary questions and practice problems are provided and although the book is written to be read in sequence, it will also be a useful reference. The central theme of the book focuses on the value of unit analysis in solving quantitative problems, with explanations on how to avoid errors in calculations and in checking, understanding and deriving formulae and equations. As a background to this, there is extensive treatment of physical units, both individually (e.g. kg, m, mmol) and in combination (e.g. m s¯², mmol L¯¹), and also of other aspects of quantitative thinking. A variety of topics (mostly from physiology, pharmacology and biochemistry) are used to demonstrate these calculations in practice. Dr. Richard Francis Burton, Honorary Research Fellow, Thomson Building, Institute of Biomedical and Life Sciences, University of Glasgow, UK. This book, and how to use it. 1. Unit analysis: the neglected key to confidence. 1.2 Ways of writing composite units. 1.3 How unit analysis can guide thinking and help solve problems. 1.4 When to specify substances along with units. 1.5 The need to use appropriate and compatible units in formulae. 1.6 Checking and deriving formulae. 1.7 When unit analysis raises questions about formulae. 2. Units: length, area, volume, mass, moles and equivalents. 2.1 The Système International and unit prefixes. 3.1 When percentages mislead: human body fat and fat in milk. 3.2 Heat loss from the body: further questionable percentages. 4. Composite units I - density. 4.3 Two definitions of body density. 4.4 Thinking about a formula. 5. Composite units II - concentration. 5.1 Concentrations: kilograms of water vs litres of solution. 5.2 Simple protein-free salt solutions. 5.3 Millimolar and millimolal concentrations in blood plasma. 5.4 Some quite different uses for Eq. (5.1). 6. Aspects of problem solving. 6.1 Letting unit analysis solve the problem. 6.2 ‘Let x be the unknown’. 7. Making up and diluting solutions. 7.1 Preparing 250 mL of 150 mM NaCl from the dry salt. 7.2 Preparing dilutions from stock solutions. 9. More about solutions - electroneutrality, osmotic pressure and activity. 9.1 The principle of electroneutrality. 9.2 But what about membrane potentials and short-circuit currents? 9.8 Effective osmolality, effective osmotic pressure. 9.9 Osmotic shifts of water between cells and extracellular fluid. 9.10 Free and bound concentrations, activities. 10. Graphs, straight lines and equations. 10.2 Advice on drawing graphs. 10.3 The equation of a straight line. 10.4 Finding the equation of a line that passes through two specified points. 10.5 Drawing a line that is defined by a specified equation. 10.6 Finding the equation of a line from its gradient and the coordinates of a single point on it. 10.7 Finding the line that best fits a number of points when these lie only roughly in a straight line. 10.8 ‘Proportional’ and ‘inversely proportional’. 10.10 A note on units. 10.11 On the different kinds of formulae and equations. 11. On shapes and sizes. 11.1 Areas and volumes of simple shapes. 11.2 Erythrocytes, cylinders and spheres. 11.3 The swelling of erythrocytes in hypo-osmotic solutions. 11.4 Distortion of erythrocytes in passing along narrow blood vessels. 11.5 An exercise in rearranging equations to eliminate an unwanted term. 11.6 Easy and general ways to check algebraic working. 11.7 Solving the equation by trial and error in a spreadsheet. 11.8 Why do we not have naturally spherical erythrocytes? 11.9 General properties of simple geometrical shapes. 11.10 Replacing volumes with masses in these equations. 11.11 A digression on graphs. 11.12 Calculating surface area from volume and height: another exercise in re-arranging equations and eliminating unwanted terms. 11.13 Another digression to check algebraic working. 11.14 Generalizing the formula to include the human body. 11.15 Surface/volume and surface/mass ratios. 11.16 The surface area of the human body. 11.17 Standard formulae for body surface area. 11.18 An exercise in comparing formulae containing exponents. 12. Body size, body build, fatness and muscularity: unit analysis as an aid to discovery. 12.1 Variations in fat-free mass with height and age. 12.2 The Rohrer index, or ‘height-weight index of build’. 12.3 The body mass index; estimating body fat from body mass and height. 12.4 Upper arm muscle: how its cross-sectional area varies with body height. 12.5 Weightlifting - and the cross-sectional area of muscle. 12.6 Estimating body fat from skinfold thickness measurements. 13.4 Rates of flow of substances carried in fluids. 13.5 Thinking about a formula. 13.6 The concept of renal clearance. 13.7 Relating the clearance formula for renal plasma flow to the Fick Principle. 13.8 Creatinine clearance as a measure of GFR, and a convenient formula for estimating it. 14. Force, pressure, energy, work and power. 14.3 Columns of water, columns of blood. 14.4 Osmotic pressure and colloid osmotic pressure (oncotic pressure). 14.7 An overview of units - from mass to pressure and power. 15. Lessons from another formula. 15.1 Poiseuille’s equation and viscosity. 16.2 The temperature coefficient, Q10. 16.3 Heat capacity and specific heat. 17. Gases: dry and wet gas mixtures, partial pressures, gases in solution. 17.1 A reminder of units. 17.2 Natural variations in atmospheric pressure. 17.4 A closer look at Eq. (17.1) and the universal gas constant, with attention to units. 17.5 Treatment of gas mixtures - percentages. 17.6 Treatment of gas mixtures - partial pressures, tensions. 17.8 ‘Standard temperature and pressure, dry’. 17.9 Dissolved O2 and CO2 in blood plasma and other fluids. 18.2 Rules for working with logarithms. 18.3 The usefulness of remembering log102. 18.4 Logarithmic scales on graphs. 19.1 Use of semi-logarithmic plots. 20. Nernst equations in physiology and biochemistry: logarithms and ‘RT/zF’. 21. pH - two definitions and a possible dilemma for teachers. 21.2 The true definition of pH: pH as a number on a conventional scale. 21.3 The meaning of 10-pH. 22. Equilibrium constants, the Henderson-Hasselbalch equation, dose-response curves. 22.4 Application of the Henderson-Hasselbalch equation to drugs. 22.5 The dependence of [AB] on [A] when ([B] + [AB]) is constant. 22.6 Concentration-response curves, dose-response curves. 23. Buffering and acid-base balance. 23.2 A link with dose-response curves. 23.4 CO2/HCO3- and non-bicarbonate buffers together. 23.5 The whole body: diet and the titratable acidity of urine. 23.6 Other aspects of acid-base balance. Appendix A. Basic mathematics and mathematical language. Appendix B. Some non-metric units. Appendix D. Solutions to problems. An innovative approach to scientific calculations and how to work with unfamiliar formulas for the biomedical and life sciences. Student friendly introduction to calculations, applying formulae and unit analysis. Includes modern, up to date definition of pH eliminating the need for logarithms, and a discussion of the importance of pH. Clearly structured with information on how to use the book and little prior knowledge of mathematics is assumed. Includes numerous worked examples and supplementary questions throughout the text to enhance student understanding. Answers to problems included at the end of the book with clear explanations from the author.